Reactions in nature frequently take place at a rapid pace. 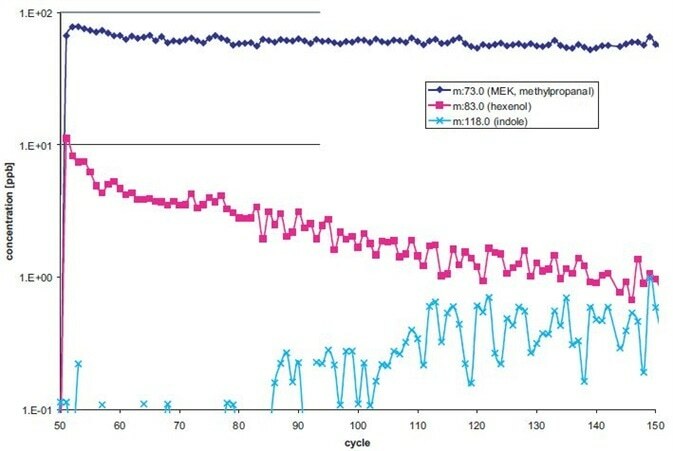 The current techniques used to analyze compounds released when damage occurs to leaves are not able to monitor plant reactions in a sufficiently high time resolution to allow for the identification of underlying reaction sequences. As a result, these fascinating relations remain a mystery, and scientists are denied the opportunity to investigate further. Instrument response times are responsible for limitations in the ability to study the interesting realm of interactions between plants and animals. Boasting extremely sensitive online measuring solutions, Ionicon Analytik empowers research groups across the globe to detect and quantify reactions occurring in nature. It is thus possible to carry out real-time analysis of leaf wounding, and the resultant interactions between animals and plants, without losing vital information in the finer details. Analysis of VOC emission following leaf cutting has been carried out using PTR-MS measurement. A variety of plants have been found to emit similar compounds, including "greenleaf volatiles," alcohols, terpenoids, C6-aldehydes, and phenolic compounds. These can been seen in Figure 1. Figure 1. Leaf wound reactions after cutting. 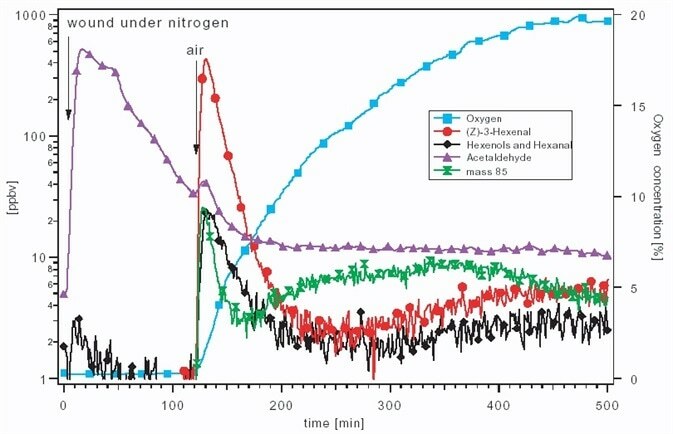 Under nitrogen atmosphere and later when in contact with air. There are a number of difficulties to overcome in the online measurement of compounds released from leaf wounds, particularly where there is a need to quantify the reactions from plants immediately after the attack, making PTR-MS the only appropriate method. Researchers are best able to monitor leaf reactions in real-time where an extremely short reaction time appears in combination with a detection limit in the pptv-range. As a result of their numerous adversaries in the natural world, plants have gradually developed defense mechanisms. Aside from direct methods of defense, including toxins and digestibility reducers amongst others, there are also a number of indirect processes in existence which relate to the third trophic level: signaling herbivore attack through the production of volatile organic compounds (VOCs). It has been demonstrated by scientists* that plants being attacked by caterpillars emit volatile organic compounds (VOCs). 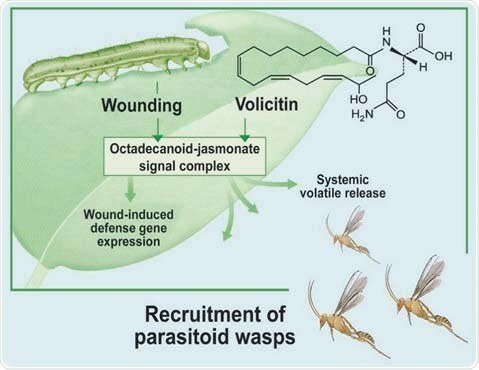 Volicitin, found in caterpillar saliva, activates defense genes, resulting in the production of indole and other VOCs, attracting wasps. The wasps then assist the plants by utilizing the caterpillars in their reproduction cycle. This can be seen in Figure 2. Figure 2. Schematic drawing of plant defense mechanism. Source: Alborn et al. (1997). Science 276: 945-949. 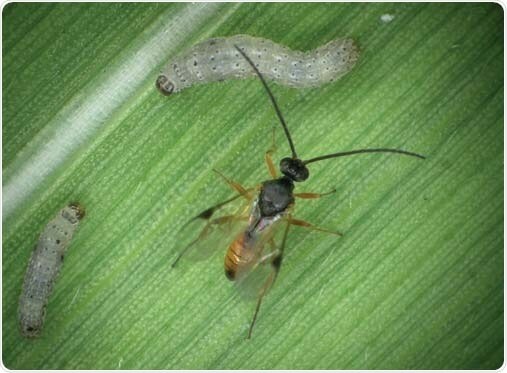 When caterpillars ingest maize, indole production is stimulated and can be identified online using PTR-MS. This can be seen in Figure 3. Figure 3. Plant reactions under attack from caterpillars. Indole (designated by the blue crosses) is released when a leaf wound (as indicated by the primary VOCs, designated by the blue diamonds and the red squares) has contact to caterpillar saliva. Figure 4. Wasps are attracted by VOCs, released by plants as a reaction to caterpillar attacks. Picture: Held.